The Department of Energy states that adequate insulation in your attic, exterior walls, ceilings, basement walls, crawl spaces, and floors, as recommended for your geographical area , can save you up to 30 % on your home energy bills. Cellulose Insulation (R-3.8 per in.) Cellulose insulation has an R value of 3.8 per inch. Cellulose insulation is made from old newspapers that are shredded and then treated with chemicals to be noncombustible and mold-resistant. Easy to install in attics when a blower unit is used, cellulose can also be blown into wall cavities through holes drilled in siding or interior wallboard to improve on exterior wall insulation. Cellulose has a few drawbacks: It absorbs more moisture than fiberglass, and can take a long time to dry out after wetting. Like all loose-fill insulation, it can blow around if disturbed. Fiberglass Batts (R-3.2-3.8 per in.) Fiberglass batt insulation has an R value of 3.2 – 3.8 per inch. Fiberglass batts come in different thicknesses and widths. 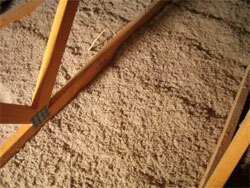 Unlike loose-fill insulation, batts won’t blow or shift around easily. Batts are easy to move out of the way if you need access to attic framing, wiring, or light fixtures mounted in the ceiling below. Careful installation is required to eliminate energy-wasting air spaces, and installation is more time-consuming because batts must be cut and placed by hand. of 3.8 – 8.7 per inch. 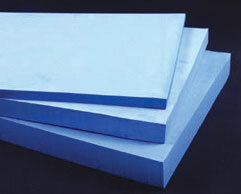 Rigid foam is available in panels of different sizes and thicknesses. There are three basic types of foam (extruded polystyrene, expanded polystyrene and polyurethane). Polyurethane foam has the highest R-value of insulation. Some foam panels are available with a reflective foil face that can act as a radiant barrier. Although rigid foam insulation board is more suitable for new construction, it can be used in retrofit applications, but accurate cutting and fitting are required. Gaps around the edges of rigid foam are often filled with spray foam. of 6 – 7 per inch. 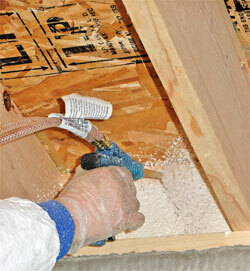 Spray foam insulation expands like magic as soon as you apply it. The foam sticks to everything, including skin and hair. And it must be popular, or you wouldn’t see so many cans of spray foam on display at hardware stores and home centers. Though the foam insulation that Tri-County Insulation & Acoustical Contractors applies is slightly different than canned foam, the benefits are the same. Spray foam is the only insulation that seals as well as insulates, so it often eliminates the need for separate air-sealing steps. Because of its expanding nature, spray foam excels at filling gaps, cracks and cavities, eliminating the energy-sapping “voids” that can occur when installing other types of insulation. What’s holding foam back from being labeled “the perfect insulation?” You guessed it: cost. You can expect to pay 2-3 times as much for spray foam insulation as you would for fiberglass and cellulose.